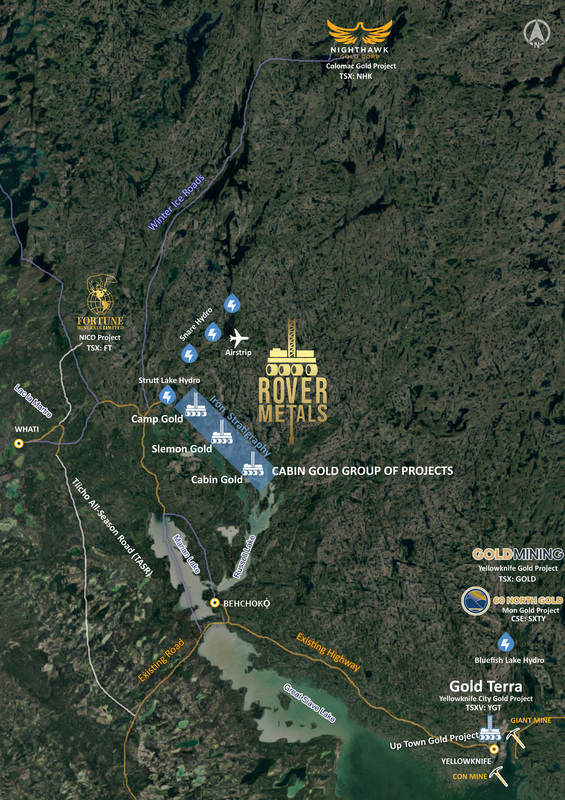 ﻿ Cabin Lake - Rover Metals Corp.
Rover Metals owns a 100% interest in the Cabin Lake group of gold exploration properties which are located 110 km northwest of Yellowknife, at the north end of Russell Lake, and 20 km southeast of Fortune Minerals Nicho project and close to the new Tlicho All Season Road. The Cabin Lake group of properties consist of three areas: Cabin Lake, Camp Lake, and Slemon Lake. The property was first prospected in 1939. In 1946, Andrew Yellowknife Mines Limited tested seven zones by drilling 39 holes totaling 2,267 meters. In 1962, ownership of the claims was transferred to Rio Algom Limited. From 1982-1984, Highwood Resources Limited performed geophysical and geological mapping. In 1985-1987 Cominco continued the exploration work by performing geological mapping in sampled old trenches, magnetic surveys and drilling program. Navigator Exploration Corporation acquired a 100% interest in the 1,305 acre property from Aber Resources Limited in February 2000. In May 2004, Navigator Exploration Corp. and Strongbow Resources Inc. merged to become Strongbow Exploration Inc. and in May 2007, Strongbow Resources Inc.‘s spinout company, North Arrow Minerals Inc. became the property owner. North Arrow Minerals Inc. dropped the claim and was re-staked by DEMCo Ltd. in September 2013. DEMCo allowed the claim to lapse and the claim. Silver Range Resources staked the claim in mid 2016 and performed a sampling program. The check samples returned assaying up to 13.2 g/t Au with 5 of 15 samples collected returning assays greater than 5 g/t Au. Past exploration concentrated on the fold limbs and the inferred fold nose remains a highly prospective untested target based on data available in the public domain. Archean sedimentary sequence of interbedded greywacke and argillite underlay the claims. This sequence has been metamorphosed to cordierite and/or andalusite grade. Within the sediments are interbedded amphibolitic iron formation and garnetiferous schist. In the northern part of the claim group, granite intrudes the sedimentary package. South of Cabin Lake, small granitic pluton intrudes the sediments. Pegmatitic, granitic - felsic porphyry and mafic dykes intrude the metasedimentary rocks. Proterozoic diabase dykes intrude all Archean lithologies. First phase isoclinal folds (F1) are northwesterly-oriented, refolded by a second (northeasterly) phase, and possibly a third (northeasterly) phase (F2, F3). The most prominent cleavage is northwesterly trending, oriented from 5° to 15° clockwise from bedding and is axial planar to minor folds that post-date F1. An east-trending regional metamorphic isograd to the south of the property marks the boundary between low-grade rocks to the south and medium-grade (cordierite-andalusite-bearing) rocks to the north. Gold is associated with amphibolite (silicate facies) iron formation beds that vary in width from several centimeters to over 10 meters and are discontinuous along strike. Several distinct iron formation units have been identified on the property. Amphibolitic iron formation locally contains siliceous nodules, garnets, and up to 25% sulphides. Pyrite, pyrrhotite, and arsenopyrite, the main sulphides, vary from semi-massive laminated or bedded, to disseminated. 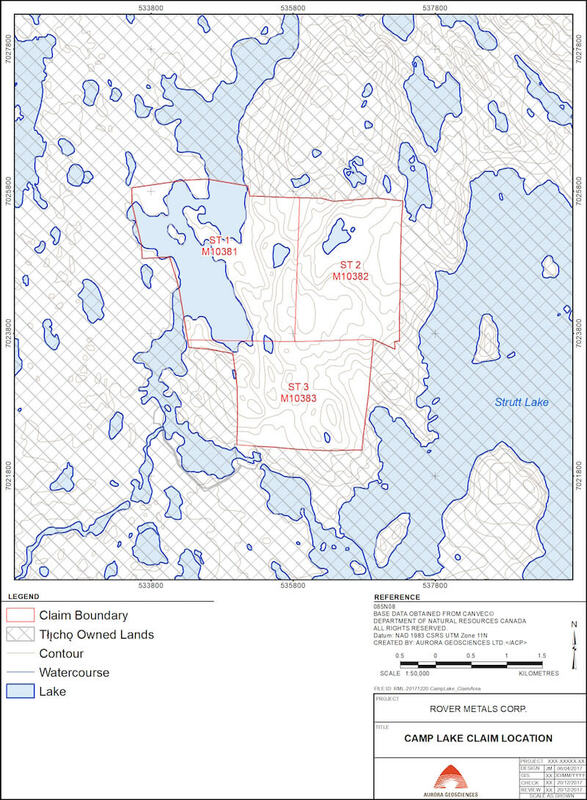 Three historic resources are reported on the property in the NWT Minerals Database (NORMIN 085OSW0001). On the south limb of the fold, Aber Resources Ltd. reported a resource of 100,000 tons at 0.30 ounces per ton gold in their annual report while on the north limb of the fold, Energy Mines and Resource Canada Mineral Bulletin MR223 records a mineral inventory of 43,900 tonnes at 4.39 grams per tonne gold in the Bugow Zone and 18,100 tonnes grading 7.89 grams per tonne gold in the Andrew North Zone. The reader is cautioned that these resources are historic in nature, do not comply with National Instrument 43-101 and have not been verified by Rover Metals. Technical information with regads to the historical resource has been approved by Mike Power, M.Sc., P.Geo., President and CEO of Silver Range Resources Ltd. and a Qualified Person for the purposes of National Instrument 43-101. 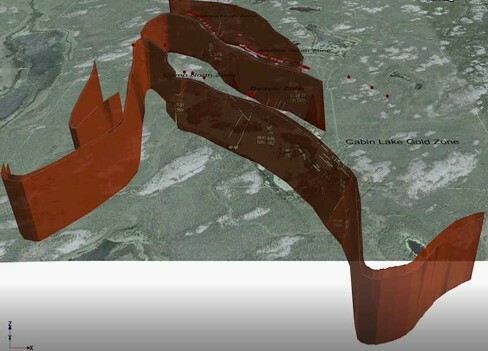 The figure represents the results of the airborne magnetic survey carried out at the Cabin Lake property in September 2018 as well as the location of the soil geochem stations, and traces of historical drillholes for reference. 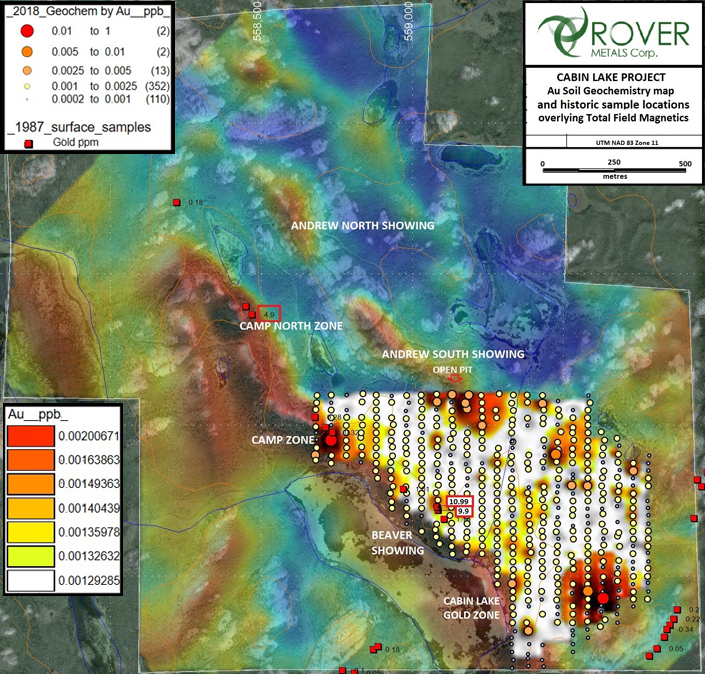 The Total Magnetic Intensity ("TMI") map and the enhanced First Vertical Derivative ("1VD") map show with great accuracy the Bugow Iron Formation (hotter colors) in a tight folding pattern, host of the known gold mineralization at the property, and within it, the areas of higher magnetic intensity (wider, or richer in magnetite and pyrrhotite). The 1VD map better defines the regional structures that affect the Bugow Iron Formation, particularly the prominent NNW-SSE trend of fold axis of isoclinal folding and the wider amplitude of second stage NE-SW fold axis parallel, coincident with a consistent and tight structural corridor (fractures and lineaments). Other NNE-SSW structures are observed deforming the Bugow IF at Cabin Lake Gold showing, north of Camp and between the Andrew North and Andrew South, this last showing a gap in magnetic intensity, where surface mapping revealed at least three zones of sulphidized iron formation, and thus potential targets. Structures crosscutting or affecting the Bugow Iron Formation (folding, or displacing) seem to be coincident with the gold anomalous zones tested from 1986 to 1990. The figure represents the results of the the Geochemical Survey. Even at the ultra-trace level there is a strong coincident gold anomalies around and on known historic gold mineralization areas, particularly over the Camp and Andrew South Zones. The survey also shows a new additional well-defined anomalous zone in the south-east zone of the property. The interpretation of the results from field reconnaissance, the magnetic survey and the preliminary soil sampling analysis supports the hypothesis of a gold bearing system in the form of a shear corridor intersecting a series of folded iron formations, with gold preferentially being deposited within sulphidized sections of the iron formations in such zones. Rover Metals’ interpretation supported by the new gold in-soil anomalies, also supports the hypothesis that there is a much more extensive gold system than initially discovered by Aber Resources’ historic exploration drilling in the late 1980’s which only focused on one folded section of the Bugow Iron Formation. Rover Metals has identified repetitive targets within these northeast-southeast shear corridors. The Company believes the Cabin Lake system is similar in kind and style to the historic Lupin Gold Mine in Nunavut, Canada, and to some extent to the Musselwhite Gold Mine in Ontario, Canada. The program consisted of 485 samples covering an area of approximately 1,150 meters x 600 meters (69 hectares) following lines north-south oriented and spaced 50 meters between each other. Sample stations were placed every 25 meters within the lines. Samples were taken using auger tools below the topsoil wherever possible. Even though the region is known to be locally covered with glacial till, the surveyed area was selected by its outcrop exposures on known mineralized zones for comparison and reference over other possible zones within the property boundaries. The Geochemistry Survey also reveal coincident anomalies of pathfinder elements to this style of gold mineralization such as Arsenic, Sulphur (%) and Copper on top of the magnetic anomalies following the Bugow Iron formation. Slemon Lake is located 125 kilometers northwest of Yellowknife and 4 kilometers northeast of Slemon Lake. Exploration first began in the area in 1939. There were two historic small exploration adits. The north shaft averaged 7.2 g/t Au across 0.98 meters and had a depth of 4.6 meters. The south shaft had a depth of 8 meters, and averaged 63.1 g/t Au over 0.24 meters. There has been a total of 44 diamond drill holes totaling 1,546 meters drilled to date and this has successfully determined that the veins extend to at least a depth of 45 meters, with a maximum reported strike length of 30 meters. 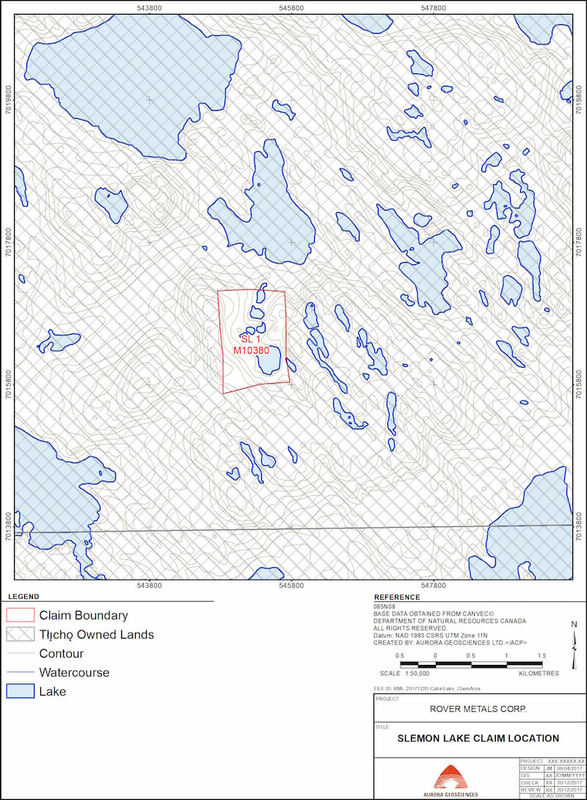 The property is located in the Russell Lake - Slemon Lake sub-domain of the Archean Yellowknife Supergroup. The Slemon Lake deposit/showing occurs within quartz veins in sheared greywackes and slates, and in quartz stockworks and breccias, associated with quartz porphyry sills, which have intruded the sediments. So far, these areas seem to be of limited extent, however, gold values over 102 g/t have been reported. The quartz veins strike variably, but generally in a northwest direction, and dip sub-horizontally to near vertical in several areas. The stockwork/breccia zones strike variably, with the zone reported to be approximately 45 meters in diameter. The stockwork has been interpreted, by Noranda geologists, to be within iron formation. 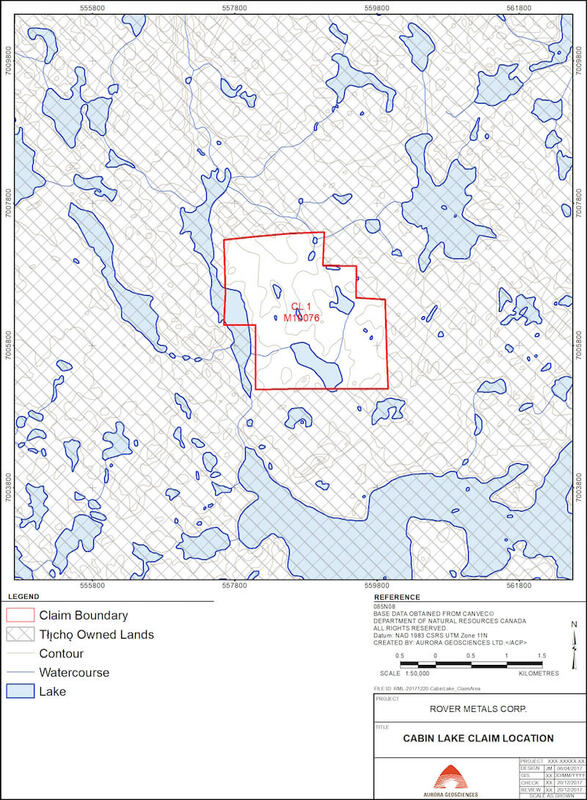 Camp Lake is located on the East side of Snare River approximately 131 kilometers northwest of Yellowknife. The area was first staked in 1938. Historic work was completed by American Yellowknife Gold Mines in 1945, which included a 20-hole (614 meter) drill program. Snare River Mines was formed to develop the property. In 1954, Tarbell Mines purchased the assets, which included the Camp Lake claims. Subsequently, Anglo United Development Corporation, in 1965, drilled a total of 44 holes totaling 4,370 meters. In 1995 Hawkeye Gold International carried out geological mapping and geophysical surveys were carried out (AR 083831). During 1997, a 179 line-km airborne magnetic and EM survey, geological mapping, and prospecting were completed. The deposit lies on the southwest margin of the Slave Geological Province, also located within a few kilometers of the boundary between the Bear and Slave geological provinces. A series of tightly folded and faulted sediments dominate the Slave province. Plutons, ranging in composition from gabbro to granite (along with dykes of mafic to felsic composition) intrude these sediments. Volcanic rocks, again of mafic to felsic composition, are common throughout the area. The Camp Lake deposit is divided into two areas. The northern area is made up of three distinct zones, while the southern area is one zone. The major rock types in the deposit area are metasediments, mainly coarse grained to argillitic greywackes, with minor intrusive plugs, and dykes. Foliation is reported to be roughly parallel to bedding in a northwesterly direction and dipping 60 to 70 degrees east. Small faults run northeasterly, and dip approximately 50 degrees, with small horizontal displacements. Shear zones, when present, are roughly parallel to bedding. Quartz veining is significant in the shear zones, however they are generally narrow, with limited strike extension. Mineralization is in general restricted to the quartz veins in shears, and consists of pyrite, arsenopyrite, galena, and minor sphalerite. Silicification with minor carbonatization, and sericitization are the predominant forms of alteration within the shears and in proximity to them. Technical information for Cabin Lake, Slemon Lake, and Camp Lake has been approved by Raul Sanabria, P.Geo., Vice-President Exploration of Rover Metals Corp. and the Qualified Person for the purposes of National Instrument 43-101.